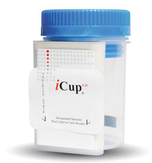 The iCup urine drug tests are capable of detecting up to 12 drugs. These urine drug tests are accurate and easy to use. Check out the iCup urine drug tests instructional video below.